Yes, it’s sale time again, with some brief sales for the American Thanksgiving holiday to start with, and with the more general holiday sale already underway at Family Tree DNA. • AncestryDNA’s kits are now $79 on sale, down from the usual $99. At the same time there’s a 20% off Ancestry subscriptions sale going on for those who want to expand what they can get from their DNA testing. Both offers expire on 11/23/2017 at 11:59 p.m. ET. • MyHeritageDNA has its kits on sale for $59 through November 23. • At 23andMe, the sale price is $49 if you buy two or more ancestry kits, usually priced at $99 each (the $199 health and ancestry kits are not on sale). And then there’s the Family Tree DNA holiday sale that will last through the Christmas season. There’s a lot more on sale there because, unlike the other testing companies, Family Tree DNA offers a full range of genealogical DNA tests, including YDNA tests for the direct paternal line and mitochondrial DNA (mtDNA) tests for exploring the direct maternal line. • The Family Finder autosomal test, usually $79, is on sale for $59 through the end of the year. • The basic 37-marker YDNA test, usually $169, is on sale for $129. The 67-marker test, usually $268, is priced at $229 and the 111-marker test, usually $359 is priced at $299. • The full mtDNA sequence test, usually $199, is on sale for $169. • Family Finder plus Y-37, usually $258, is priced at $178. • Family Finder plus Y-67, usually $357, is priced at $278. 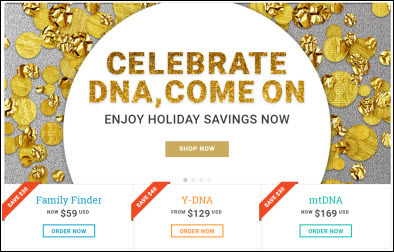 • Family Finder plus full mtDNA, usually $288, is priced at $218. • Family Finder plus Y-67 plus full mtDNA, usually $556, is priced at $442. Perhaps the most intriguing bundle is this: if you already have a YDNA test in the system, and you upgrade to the Big Y test at the sale price of $475 (usually $575), your regular YDNA results will get upgraded to 111 markers for free. That is a lot of YDNA testing for a much smaller than usual price. Rounding out the list of DNA holiday sales, there’s a sale going on at LivingDNA, with its focused ethnicity test selling for $99, down from the usual $159. There’s bound to be an expiration date — it’s billed as a holiday gift sale and the graphic has a Christmas ribbon on the test kit — but in the few minutes I spent exploring the web page I couldn’t find it. In other words, there’s something for everyone on sale right now… no excuses for not getting that DNA test done. Keep in mind LivingDNA is good for those with strong British Isles ancestry as it’s more detailed. At this time, LivingDNA is only good (meaning really useful for genealogy) for those with strong British Isles ancestry. It’s expanding beyond there, but that’s it’s strong suit for now. I have a big problem with that… not that we are major criminals… but these have been purchased for one purpose, Genealogy… ! (a) Except in the most extraordinary of cases, where a very serious crime is involved and the police get a court order, the government isn’t in the least bit interested in getting your DNA sample from a genetic genealogy company. If the government wants your DNA for analysis, it will get it — directly — from you — with a court order — so that it can use it in court. (It can’t use a sample from these tests in court because there’s no proof of chain of custody.) (b) The kind of tests we do aren’t even particularly useful to the police because the police want proof that you and only you committed the crime — in other words, proof of unique identity — and our tests are trying to link us together not show how we’re unique. (c) If anybody in your family has served in the military in the last 30 years or so, your family DNA is already on file. So (d) relax and buy the tests. For unknown parentage cases, you want to test as widely as possible, and do autosomal testing with at least AncestryDNA and Family Tree DNA, adding 23andMe, MyHeritage and others as you can afford them.